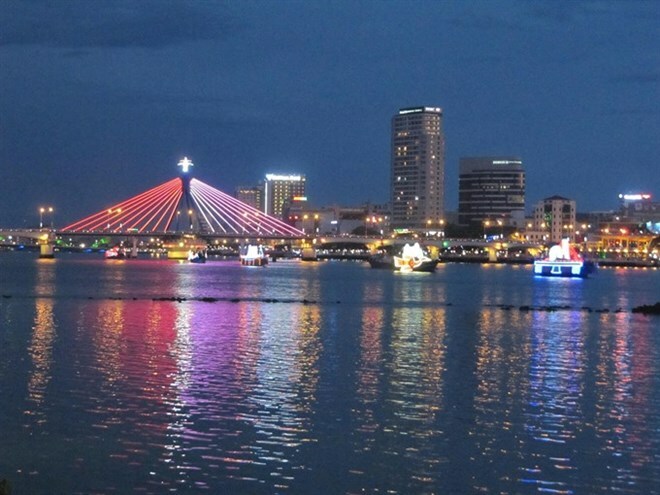 Da Nang (VNA) – The Da Nang People’s Committee on August 28 decided to open three new passenger transportation routes on the Han River, all beginning and ending at the Han River Port. The first route, from Han River Port to Tran Thi Ly Bridge, Thuan Phuoc Bridge and back to the port, operates from 7.30am to 10.30pm daily, ending at 11pm on weekends and holidays. The second one departs from the port and stops at the Thuan Phuoc Bridge and Son Tra Peninsula before returning to the port, running from 7.30am to 5.30pm. The final route also takes in Thuan Phuoc Bridge before stopping at Sung Co Beach and Chao Islet before coming back to port from 7.30am to 5.30pm. To operate on the routes, boats must be certificated by Vietnam Register that they are qualified for travel in waters with waves of two metres and can travel on both river and sea. Each boat can carry 30 – 250 passengers. Boat crews must have licences and certificates. After the Thao Van 2 boat accident, the central city’s authorities have tightened management on the Han River. On June 4, 2016, the Thao Van 2 boat, carrying 56 people (three crew members and 53 passengers, including four Malaysians) capsized in the river between the Han Bridge and Thuan Phuoc Bridge just five minutes after leaving the pier.